On 26 September, the Maldive opposition newspaper Minivan News reported that the Maldives president of the republic Mr Gayoom "directly confronted" Pope Benedict XVI for repeating an assertion made by the Byzantine Emperor Manuel II Paleologus that Islam was spread by the sword. According to Minivan News, Mr Gayoom stressed that Islam was a religion of friendliness and compassion. Although the semi-official Maldive newspaper Haveeru gave coverage to the Pope's remarks in eleven articles, it did not cover this story. Both the Maldive government and the opposition are very careful not to cover stories that might upset the West. The Maldive media used to cover anti-Western material in the local language but now they realise that this could also be a risky enterprise. They judge others by their own narrow-minded standard. Haveeru refers to the Pope in the lowest form of address reserved for those they would regard as not deserving any respect. The Maldive media, commerce, opposition and government have long adopted the mode of speech used by the aristocracy to address themselves and those that they respect. They are not always successful in imitating the aristocratic mode of speech, but they try. Usually foreign dignitaries and heads of sovereign states are addressed in this form of speech in the media. The only exemptions to this rule under the medrassa-indoctrinated mullahs who are currently ruling in the Maldives are the leaders of the State of Israel and the Vatican City State. Since 1978, the leaders of these two states have always been addressed in the lowest terminology imaginable. It is interesting that while the Maldive government, its media and the opposition demand respect from others they are not always forthcoming when it comes to reciprocating this respect. One day in the mid 1980s, the disturbing noise of police sirens was heard in Oakidu Magu street in Malé, coming towards a well-known bookshop situated halfway along the southern side of the street. (The shop has since moved to the vicinity of the junction of Majeedi Magu street and Chandani Magu street). A convoy of the dreaded National Security Service (NSS) military vehicles screeched to a halt in front the bookshop and jack-booted soldiers poured out. Some sneakily positioned themselves outside like extras in a James Bond movie, scanning the distance in order to fend off any approaching Swiss guards. Others charged into the cramped store, tore down the Time magazine cover poster similar to the one shown here and seized all copies of that day's issue of Time. The commander of the operations then ordered the shop staff out on to the street and padlocked the bookshop. To the relief of the retiring, mild-mannered owner of the store, no one, except the Pope, was taken into custody that day. 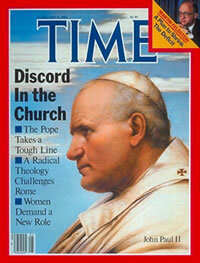 The cover depicted a photo of none other than Pope John Paul II, an individual outlawed by the Maldive republican authorities. The urgency of the operation was the result of the fact that the order to seize the issue of Time came directly from the commander-in-chief of the NSS and mullah-president of the republic who is the most decorated soldier in the history of the NSS. Any mention of the late Pope John Paul II or depiction of his image in the tightly controlled Maldive media remains a criminal offence following the seizure of power in the Maldives by the still-incumbent Arab-colonialist faction of Egyptian-trained mullahs in November 1978. The hostility towards the saintly pontiff who commanded the respect of the majority of mankind, as seen at his funeral, is extraordinary to say the least. The proceedings of the Pope's final rites were watched live by billions of people around the world and were attended by 4 kings, 5 queens, His Royal Highness the Prince of Wales (who had postponed his wedding for a day), President Bush, about 70 other presidents and many prime ministers. The mourners included Iranian president Hojjetoleslam Mohamed Khatami, Afghan president Hamid Karazai, Syrian president Bashar el-Assad, Jordan's king Abdullah and many other Islamic dignitaries and some leading mullahs. Sworn adversaries shook hands and displayed civility at the funeral. Syrian President Bashar el-Assad was seen shaking hands and exchanging a word with Israeli President Moshe Katsav. Mr Katsav and Iranian President Khatami were seen engaged in a conversation. Later Mr Katsav, who is an Iranian-born Israeli, confirmed that he spoke to Mr Khatami in their native tongue, Farsi. Both Mr Katsav and Mr Khatami were born in the same town in Iran. The nostalgia-filled compatriots exchanged memories of the neighbourhood of their youth, back in the bad old days before the Islamic republic. The insecure attitude of the Maldive mullahs towards the Pope is a clear acknowledgement of their lack of faith in what they believe and what they wish others to follow. They are in fact admitting that the very sight of a picture of the Roman Pontiff is enough for their Maldive zombies to stop prostrating themselves in worship towards the Kaaba. The Maldive mullahs are clearly demonstrating that their faith is mere bunkum. There is no tradition in the Maldives of hostility towards any pope. John Paul II's predecessors, John XXIII and Paul VI regularly featured in the Maldive print and electronic media, in news reports. The conclaves to elect Paul VI, John Paul I and John Paul II were covered in the Maldive media as these events took place before the seizure of power by the Arab-colonialist faction of Egyptian-trained mullahs who are still ruling with an iron fist. This is a verse from a poem in which each verse begins with a different letter of the Divehi alphabet. The poem is in classical Divehi and refers to papal customs and sovereign immunities. The poem was written in the 1920s. Like the Maldive republican authorities, some factions of the Maldive opposition and dissident movements express condolence following the death of foreign dignitaries. Recently some media organs of the Maldive dissident movement expressed their sorrow following the death of veteran Arab terrorist and Palestinian Authority leader Yasser Arafat. Without exception, all Maldive opposition and dissident media organs based outside the Maldives failed to express condolence on the death of Pope John Paul II. The Maldive mullahs regularly accuse their domestic opponents of being Christian missionaries. One has to wonder why no one is ever accused of being a Buddhist, a Rastafarian or a Shinto missionary. Do the mullahs actually believe that there is truth in what Christian missionaries preach? Are they afraid of the truth? Whatever the case may be, this is a ploy that always works, as the opposition movement and overseas-based Maldive dissidents are mortified by the Christian-label. It is possible that their silence over the Pope's death is a result of this fear. The Maldive economy is based largely on tourist arrivals from Europe and other parts of the Western world. Europe is mourning the death of one of its most significant heads of state. Both the Maldive authorities and the opposition movement are competing with each other to woo opinion in Europe. Given this, the lack of mention of the Roman Pontiff's death by both the Maldive authorities and the opposition movement is regarded by the Official Website of the Maldives Royal Family as a deliberate snub directed largely at the people of Europe, the United States, Canada, Latin America and Australasia. While the Maldive head mullah and president of the republic harbours uncontrollable hatred and envy towards Christians and the West, he and the people of the Maldives depend on Christians and the West who contribute through tourism and international aid. The funds so obtained are used to line the pockets of officials and to finance the day-to-day upkeep of the mullah's palace, retreat island, and luxury yacht. 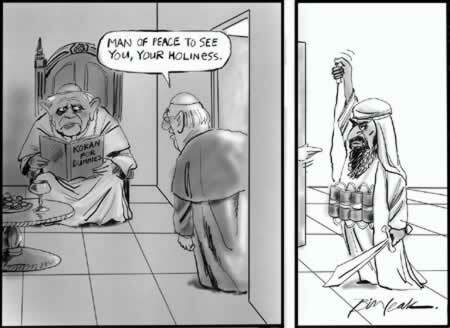 This type of behaviour can only be summed-up as the hypocritical duplicity of a despot and his followers who want to parasite off Christians and the West to their own personal advantage. If these people hate the West with such passion, it is suggested that they do not use or abuse Western aid, finance, tourism revenue, technology and knowhow. They must stop travelling to the West for its health and educational facilities. A better strategy for them is simply to slide back into the dark ages. The Maldive president of the republic and head mullah's decree to snub the Pope is an explicit and calculated insult on the West. There is no cultural, religious or historical basis for it. ALBANIA - President Alfred Moisiu, former presidents Sali Berisha and Rexhep Meidani, Prime Minister Fatos Nano. BANGLADESH - Food and Disaster Management Minister Chowdhury Kamal Ibne Yusuf. Even the sun mourned the Supreme Pontiff but the Maldive authorities ignored: Minutes into the funeral mass for Pope John Paul II, the official Maldive media began broadcasting a Friday sermon written by the Maldive mullah-president of the republic. Any mention of the late Roman Catholic Prelate or depiction of his image in the tightly controlled Maldive media remains a criminal offence following the seizure of power in the Maldives by the still-incumbent Arab-colonialist faction of Egyptian-trained mullahs in November 1978. In stark contrast to this mean attitude of the Maldive republican authorities towards the saintly Polish Pontiff, his colourful funeral was watched live by billions of people around the world and was attended by 4 kings, 5 queens, His Royal Highness the Prince of Wales (who had postponed his wedding for a day), President Bush, about 70 other presidents and many prime ministers. The mourners included Iranian president Hojjetoleslam Mohamed Khatami, Afghan president Hamid Karazai, Jordan's king Abdullah and many other Islamic heads of state and leading mullahs. The world dawned to a new day over the International Date Line just three hours following the burial of the Pope and as the sun rose, it was in eclipse. It appears that the Butcher of Maafurhi and his motley crew in the Maldives are out of step with the world, yet again. Even in the Maldives many people ignored the Friday sermon and joined the world to watch the funeral rites live on foreign cable television. Condolences: The Official Web Site of the Maldives Royal Family sends its condolences to the 1.1 billion faithful of the world's biggest religious denomination, the Roman Catholic Church, on the death of its Supreme Pontiff, Pope John Paul II. Cardinal Karol Wojtyla, as the Pope was then known, succeeded to the Throne of St. Peter on 16 October 1978. He is remembered as a key figure who was instrumental in the collapse of Communism. A native of Poland, John Paul II was the first non-Italian pope in 455 years. 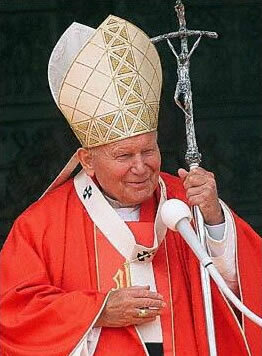 Without a doubt, Pope John Paul II was among the mega personalities of the 20th century and a champion of world peace. Congratulations to the new Pope: The Official Website of the Maldives Royal Family congratulates Benedict XVI on his election as Pope. The Bavarian-born former Cardinal Joseph Ratzinger has, until now, been the Prefect for the Congregation for the Doctrine of the Faith and Dean of the College of Cardinals. The 265th occupant of the Throne of St Peter, Pope Benedict XVI is the first pontiff from a German-speaking state since Victor II (1055-1057). This web site calls upon the Maldive republican authorities and the Maldive opposition and dissident movements to join us in congratulating this new head of a respected European state and spiritual leader of the biggest religious denomination in the world. Both the Maldive authorities and the opposition movement are currently competing with each other to woo opinion in Europe- the authorities in order to hold on to power and the opposition/ dissident movement to seek assistance in gaining power. Both groups' failure to acknowledge an important transition in Europe such as the election of a new Pope leaves no room for any doubt over their duplicity. Their concealed hatred of the West is self-evident because when it comes to acknowledging the leader of a fifth of mankind, they refuse to follow even their Arab colonialist masters.